A found footage horror movie, The Blair Witch Project preys on unseen threats but is otherwise more about raw style than any substance. 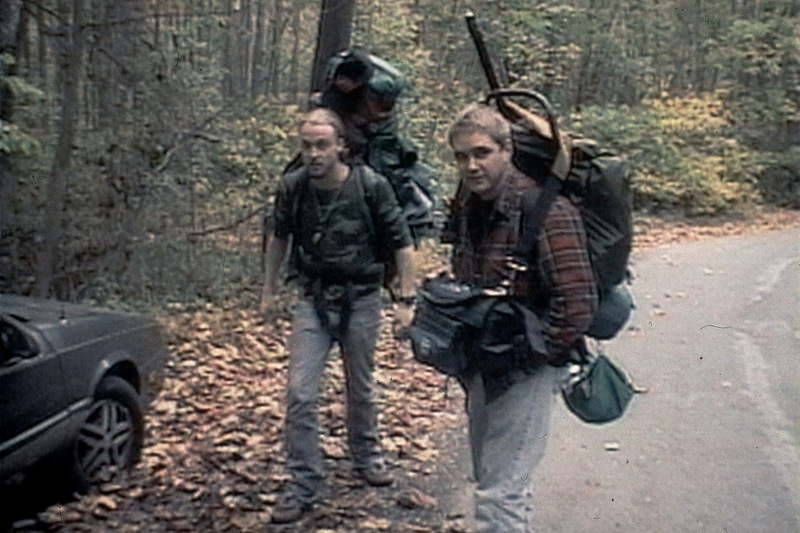 Three film students (Heather Donahue, Michael C. Williams, and Joshua Leonard, playing characters with the same names) set out on a camping trip to film a documentary in a wooded area near Burkittsville, Maryland, where according to legend evil things happened generations ago. Locals talk about the disappearance of young children, gruesome murders, and witches. None of this perturbs Heather, who leads the trio, while Josh is cocky and Michael a little unsure. Navigation in the woods proves to be a challenge from the outset, with Heather's map of limited use, and the three filmmakers start to bicker, not sure how they lost they are. They stumble onto strange small rock formations, and then spooky twig creations. At night they are surrounded by strange, threatening sounds. Tempers start to fray as they well and truly get lost deep in the woods, but much worse is to come for Heather and her two colleagues. An independent production cobbled together on a miniscule budget and co-directed by Daniel Myrick and Eduardo Sánchez, The Blair Witch Project is the little horror movie that could. A triumph of marketing, spin and unconventional buzz, Myrick and Sánchez were able to back-up their gumption with a film mounted on a platform of honest creepiness, making up with spirit what the project lacks in polish. The horror elements are purely based on what the mind can conjure up on its own. Very few actually scary things happen on the screen. The Blair Witch Project just sets the context and sits back, allowing indistinct sounds, rocks, twigs and the imposing woods at night to trigger undefined fear. What makes it onto the screen is plenty of hand held, jittery and grainy footage filmed by the campers themselves, with endless shots of nondescript trees, thick bush, streams, and nighttime fuzziness. One camera captures the trip in black and white, while the other is in colour. What passes for dialogue is generally improvised banter that degenerates into irritated arguing fuelled by fear, as Heather, Josh and Mike slowly understand how much trouble they are in and start blaming each other. They walk for long hours and days to try and return to civilization, but these woods hold their secret well: entering is easy, getting out not so much. The Blair Witch Project achieved massive commercial success and triggered a mini wave of found footage horror films. The scary moments may be modest, but the film's reach was nevertheless impressive.